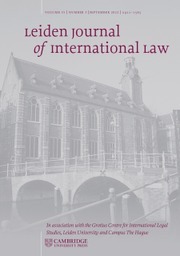 Firmly established as one of the leading journals in the field, the Leiden Journal of International Law (LJIL) provides a venue for sharp and critical voices that speak on the theory and practice of international law. It aspires to introduce or amplify refreshing and innovative approaches to perennial as well as topical issues in the field. The Journal’s focus rests on international legal theory, international law and practice, international criminal law, as well as international courts and tribunals. The international law commission’s recent work on exceptions to immunity: Charting the course for a brave new world in international law?